Toxic chemicals are everywhere nowadays! They’re in the food we eat, the water we drink, the air we breathe, the soil, the personal care products we put on our body, the household products we use in our homes, yards and garden, and the environment. The obesity epidemic, the rise in autism, autoimmune disease, neurological disorders, cancer, behavioral problems and mental health disorders. What’s to blame? It’s not our genes. Our food, water and air are being systematically poisoned. 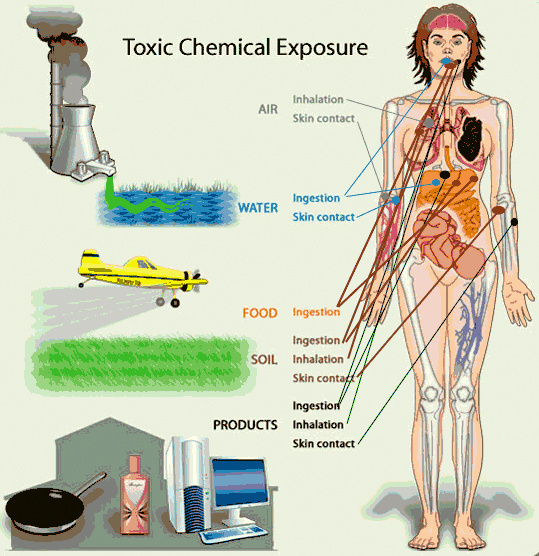 TOXIC CHEMICALS are a huge contributor! We’re exposed to more toxic chemicals nowadays in a 30-day period than our grandparents were exposed to in their entire lifetime. Couple that with an individual that has impaired methylation; their ability to detox these toxic chemicals is inhibited. Over time, the toxic burden of these chemicals buildup and accumulate in our brain, cells, organs and body affecting how we feel, function, think, perform and look. Infants, children, fetus and pregnant women are especially vulnerable to toxic chemicals. Toxic chemicals are passed from the mother to the child through the umbilical cord and breast milk causing pre-polluted babies. Toxic chemicals can accumulate and pass from one species to the next through the food chain. They’re hazardous to humans, pets, animals, wildlife and the environment. Bioaccumulation of chemicals and toxic metals often from repeated low-level exposures are the cause of many chronic mental and physical health problems. Research appearing in the Journal of Neuropsychiatry (1992;4:189-94) linked chemical and pesticide exposure to violent behavior. Are toxic chemicals making you fatigued, fat, depressed and sick? Studies have linked phthalates, pesticides, PFCs, toxic heavy metals and several other toxic chemicals to hormone changes, lower sperm count, less mobile sperm, birth defects in the male reproductive system, obesity, diabetes, low testosterone and thyroid irregularities. Hormone imbalances including impaired thyroid function, adrenal insufficiency, low testosterone, and estrogen dominance. Studies have identified an association between chemical exposure (e.g., to phthalates, polychlorinated biphenyls (PCBs), dioxins, and nonpersistent pesticides) and lower levels of testosterone. Chemicals are either ingested, inhaled or absorbed. 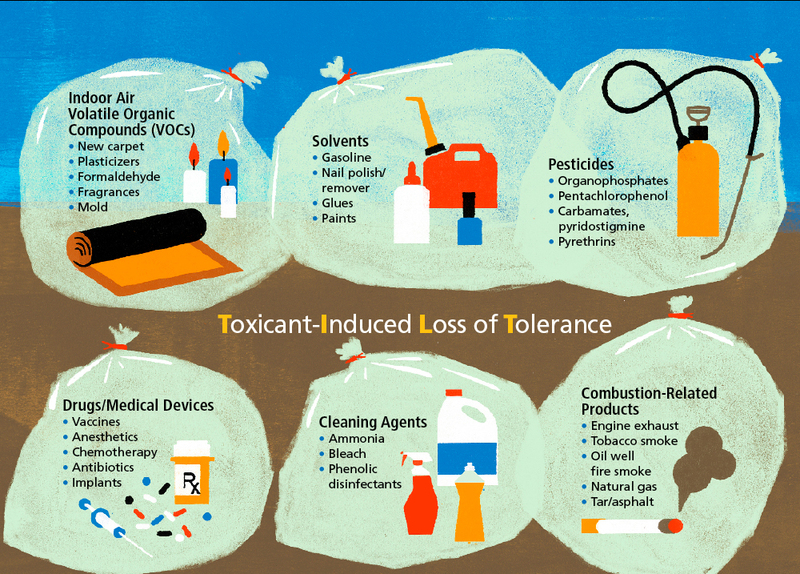 There are many things within our control that we can do to reduce our toxic load and the harmful effects of chemical exposure. Lowering our toxic burden can help reduce our risk of cancer and other chronic illnesses. Important factors are awareness, avoidance, and making the necessary adjustments and changes by addressing food, air and water quality, home, garden and personal care, and flame retardant furnishings. If you see any of these ingredients on any product, leave it on the shelf! If you have an infant, breast-feeding is ideal; if not able to breast feed, homemade organic formula is a must. All grains contain mycotoxins! Avoid grains, gluten, fast food and processed frankenfoods. Food scientists use dangerous chemicals to make you eat, and buy more junk food. There are too many people counting calories, and not enough people counting chemicals! Filtering your shower water is a necessity (not an option or a luxury). Install a water filter in your home, especially for the water you drink, cook with and shower in to minimize exposure to fluoride, chlorine, toxic metals, microbes, industrial pollutants, pharmaceuticals and other harmful chemicals. You absorb 3x more chemicals through your skin than when consumed orally. Even if you’re not taking any prescription drugs, they’re in the water supply (chemo drugs, oral contraceptives, hormones, hypertension meds and many others)! Avoid bottled water in soft plastic containers and plastic water bottles that have been in a hot car, garage or warehouse. Avoid camel-backpack type water containers. Avoid bottles and containers with the numbers 3, 6 and 7 on the bottom. Opt for ceramic, glass and stainless-steel cookware and food storage containers. Avoid Teflon and aluminum cookware, plastic wraps and aluminum foil. Avoid mercury amalgam fillings. If you have mercury amalgams, consider having them removed. Use HEPA air filters and change them monthly. Consider an air purifier for your bedroom, car and office.